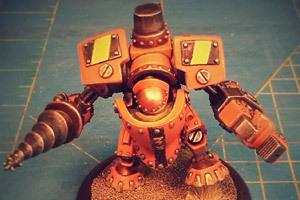 Blog Warmachine: Heavy Metal Rhulic Rules! Play like you’ve got a pair… of beardless dwarves? But as long as I’ve been a wargamer I’ve also been a dwarf fan so the choice was easy when the Mercenary Rhulic starter box came out. A bit light on the beards perhaps…but at least original. 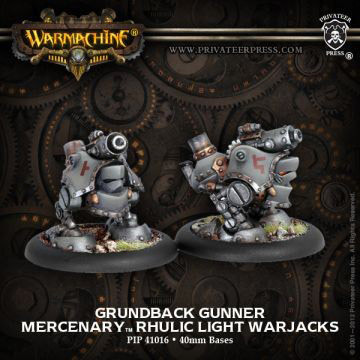 The rhulic models were even more limited at the time then most other factions so I didn’t have much choice in what to pick really; Gorten Grundback with his battlegroup of a Driller and 3 adorable light warjack gunners. I also bought a Privateer Press dwarf adventurer and converted him to be used as Reinholdt, gobber speculator for a small tournament. My Warhammer roots still ran deep and I just couldn’t allow a stinkin’ goblin to join my dwarves but it was the cheapest solo I could find to fill the points. I played a practice game, which was kind of a downer. The guy I played didn’t bother me to tell all the rules…especially the ones that gave him a disadvantage. And while I didn’t know much about the game yet it was pretty obvious in hindsight that he had planned a caster assassination and simply humored me a bit in the game until he triggered his plan. Of course totally forgetting to tell all the tricks from his caster he needed for that or the basic rules that could help me avoid it. I don’t mind losing, especially in a practice game. But this simply felt like a cheap shot which didn’t teach me much about the game at all. So in my first little tournament with just this one game under my belt I didn’t have any expectations at all. It’s probably just bad luck but the opponents I faced weren’t much better I’m afraid. But because I didn’t have any expectations I did enjoy the games a lot more this time. I did win best painted though! And the prize was a pick of blisters. The only Rhulic blisters packs the store had at the time were the light warjack gunners so I picked 2 more of those. 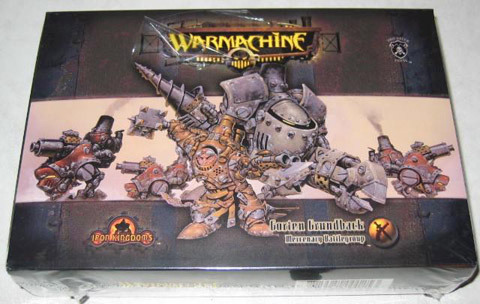 In the years after I didn’t follow Warmachine at all really. Although I did like all the new Rhulic models that were released in that time. But I wisely refrained from buying some because I knew I wasn’t going to use them. My steam-punk beardless dwarves were just gathering dust somewhere. Many years later a good friend and gaming buddy got into Warmachine at the end of the 2nd edition of Warmachine or MK2 as it is called. I wasn’t playing many wargames at the time, if at all, and his enthusiasm for the game was refreshing for a veteran player like me. When a new edition came out, MK3, I simply couldn’t resist and dug up my old Rhulic models. Which wasn’t easy! They had been lying at the bottom of a box somewhere and I’ve moved twice since I put them into storage. It’s a small miracle I found them at all mostly unscathed. After checking up on the rules changes since I played I was pleasantly surprised to find MK3 much more to my liking. And Mercenaries, especially the Rhulic part of it, was in a pretty comfortable place. Most of the changes to the new edition gave a nice boost to Warjacks in general. Those 5 adorable little warjacks I had? They are useful now it seems. Well, actually they’ve become extremely useful indeed. Buying a sizable army of rhulic models and even the Hammerfall Siege Crawler. I’ve already put everything together and undercoated it but luckily took enough photos of the process before I decided on starting this blog. I also have to confess I already started painting and finished some models. But I know from experience then staying the course and actually finishing everything BEFORE buying new models is the real challenge. Let’s hope this blog will help with that.